Yes, yes, I know LB and JL got married over a month ago, and that it's fairly ridiculous that I am posting about their rehearsal dinner now. In fact I thought about just skipping this one so that I wouldn't reveal exactly how delinquent I have been with these postings. 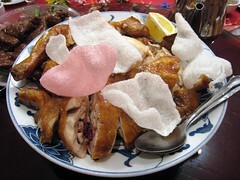 But the meal was so enjoyable, it seemed wrong to not write about it. 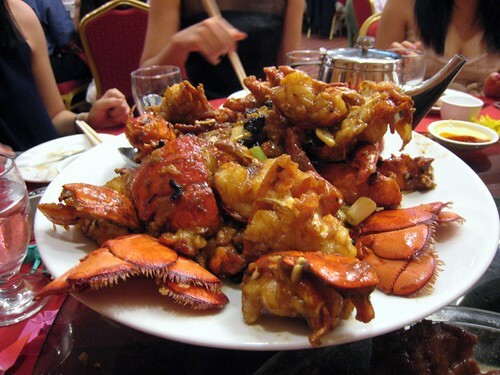 The dinner took place at Tung Yi Fung restaurant in Flushing, a restaurant I'd passed many times but never entered. Clacking along the grubby streets in high heels and cocktail dress, I made it upstairs to join the wedding party, where LB and JL had reserved several tables for friends and family. 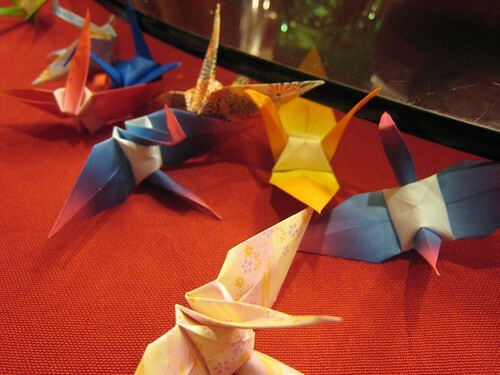 At each setting there was a scattering of folded origami cranes and a single flower wrapped around our napkins. And once everyone got settled, there was food—a lot of it, and all of it delicious, too. 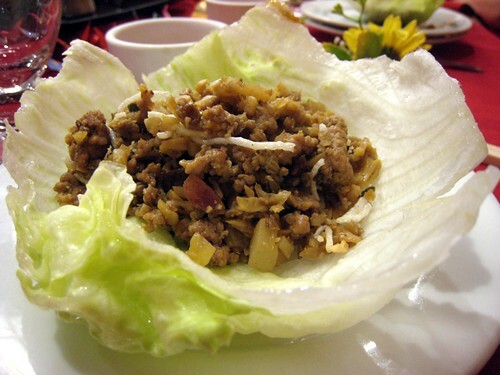 We started with a dish of what I swore of was chopped pork but was really chopped clams, mixed with noodle threads and water chestnuts and spooned into crisp lettuce cups by our waiter. The contrast of textures and flavors was excellent, and though I didn't, I was tempted to make myself another one. 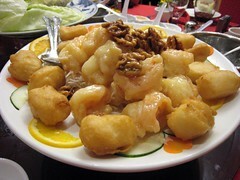 Shrimp with walnuts is always a crowd-pleaser, and here its reception was no different. 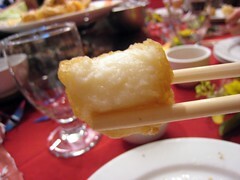 Alongside the plump, snappy shrimp were batter-covered squares of what I later learned was "fried milk," the insides of which tasted like a creamy coconut custard. One was all I needed of these, though, as they were a bit cloying. 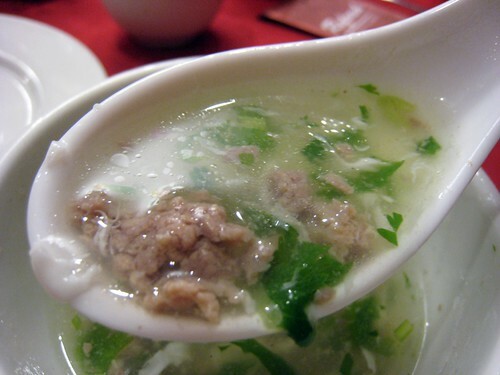 Afterwards came a light, perfectly balanced soup brimming with bits of tender beef, a generous swirl of egg, and chopped cilantro. 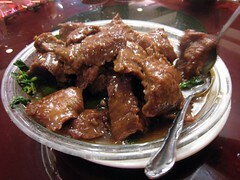 Following a dish of sauteed pea shoots and whole, fresh-killed fish steamed with ginger, scallions, and soy sauce, these large, tender pieces of beef and pieces of crispy, garlicky chicken nearly put us over the edge. Until the lobster in black bean sauce came out, that is. 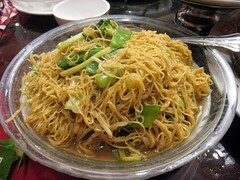 Eventually, out came the rice and noodle dishes, which as I mentioned here for Chinese banquets usually signifies the meal is drawing to a close. 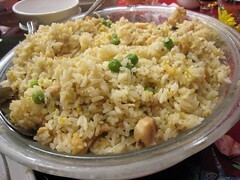 In many cases the rice dish is just a generic fried rice, but LB and JL chose a fried rice with salted fish and chicken, which had a great pop of complex, briny flavor with each bite or two. Though I was full, I was really glad they opted for this one. After they cleared away our dishes everyone took the opportunity to table-hop, chat, and snap maybe a million photos of one another. 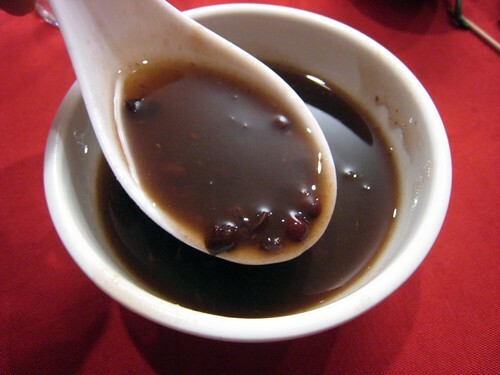 But finally there was red bean soup to finish—a sweet end to a sweet beginning for our lovebirds. The next day was the wedding! More on the meal here.